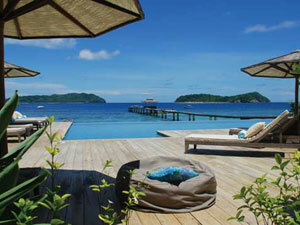 We're privileged to be able to promote the Philippines' very best private island retreats. 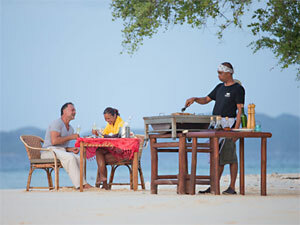 Holidaying on your own private island, under the care of a team of dedicated staff is the ultimate in luxury! Contact us with your exact specifications and let us arrange your idyllic stay, including all inter-island transfers. Bamboo Island is tropical paradise surrounded by azure-blue seas, with white powdery sand, and coconut trees - home to colourful birds and butterflies. This is the ultimate dream island, whose natural beauty has been enhanced by the creation of a zero-carbon tropical resort. With the island's own staff and cooks at hand, never has private island living been so affordable! The island uses the best local food sources, its own organic farm supplying vegetables, fruit, herbs, and poultry, cooking with natural organic ingredients. The freshest seafood and home-made bread, are available alongside fresh salads and greens, grilled meats, rice, potatoes and pasta. The island can accommodate up to 19 guests and the accommodation comprises 4 cliffside cottages (2 persons in each), 2 big beachfront huts (2 persons in each), and 1 small beachfront hut (1 pax). In addition there are 2 family sized tents, (each of which will sleep 3 persons). Ideally the minimum stay should be 3 nights. Discover the beauty of Ariara, a tropical island tucked away in an unspoilt corner of the Philippines. Whilst certainly being described as ‘off the beaten track’, Ariara Island is the ultimate private destination. Booking a stay entitles guests to exclusive use of the entire island, in the care and service of its personal staff who are there to cater for your needs and your's alone, helping to make you feel completely at home in a magical setting. Enjoy the natural surroundings with complete privacy and the freedom of having an island that is yours to explore. Ariara private island is an exclusive destination exclusively available to just one group, of up to eighteen guests, at any one time. No matter the number in your party - from 2 upwards, let us know your requirements, and we will send you a personalised quotation. 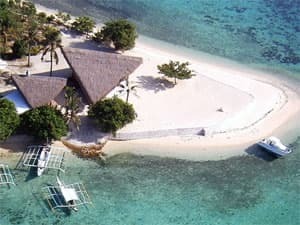 Noa Noa is an exclusive private island off the coast of Palawan, where reservations are normally limited to one booking at a time*, (with a minimum of three nights), and can accommodate up to twelve adults. Each reservation includes three meals per day, various snacks, drinks, scuba diving, boats, massage and spa treatments... Everything you could wish for! Noa Noa private island is an exclusive destination, normally available to one group at a time*. The Noa Noa staff will ensure your stay is as perfect as possible. The minimum stay is 3 nights, and the maximum number of guests is twelve adults (15 years and older). At Philippine Trails, we can take care of every aspect of getting you to your choice of Private Island, including Luxury accommodation in Manila, if needed, plus transfers.